We need to change the gym slightly we think. The idea that we have to make a few adjustments that you might be able to spot in this picture. We hope to expand the gym, dedicate areas a little bit more and add more facilities to members without changing your workout, space and atmosphere of the gym. People always are unsure of change but we really have put a lot of work to see how this can be achieved and we feel this is a good option. Whats your thoughts? Have your say and thoughts on the new upgrades to the gym, either at reception we will have a feedback form or email us. We’re looking to add gates to reception. This will stop people walking in without cards, stopped memberships and issues with payment processing can be caught and updated quicker. The gates will be electric, scan your card like normal and the gate will trigger and open or remain shut. If its shut and screen flashing as a membership issue then staff can help get you started. Weights machines from the back room will move into the main gym into the space the removal of the cardio equipment will make. This will make workouts easier and flow better from machine to machine. The studio will then be in the back room making it easier for music issues interfering with reception and the gym. The will have its own toilet and water access as well. It will be almost 3x BIGGER as well. 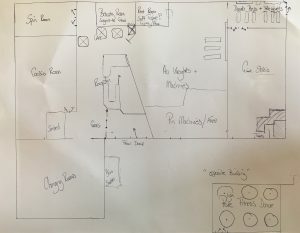 We need to finalise details for a room rented for beauty treatments and then also maybe building another room for injuries and soft tissue/ rehabilitation treatments. Lisa is also studying hard not only on her further fitness qualifications but in Pole Fitness, we hope to utilise a room across the carpark where she will run stand alone classes which will be charged or basic ones for members included in membership to get you started. We appreciate there will be a little bit of disruption while we do this and send our apologies now. We will have the studio closed for at least a week in August, were looking to run spin and maybe some outside classes and circuit type bootcamps maybe to replace these if people are interested.